Emotional Support Animals in action. Beagles get ready to board a plane. 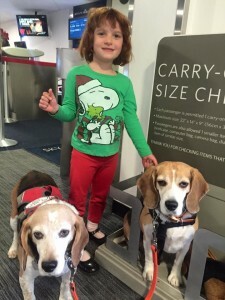 Over Christmas I flew roundtrip from New York to Chicago in a way that goes against everything airlines stand for today: I paid no extra fees and had no unnecessary paperwork despite the fact that my daughter and I flew with two beagles at our feet as Emotional Support Animals. The planes didn’t crash. The beagles didn’t unpredictably go wild. They didn’t even steal any cookies. The credit for these new flying feats goes technically with the Air Carrier Access Act that originally written to stop airlines from mistreating people in wheelchairs, sometimes by dragging them through the plane. But I think the real credit for the recent surge in people flying with emotional support animals goes back to another law change: airlines have to tell the public how many animals die or get hurt or lost when they travel essentially as freight on airlines. Both laws were revised to apply more broadly. Even with everyone paying extra attention, 307 animals died, 169 were injured and 53 lost on airlines in the 10 years ending in November 2015. The result is airlines don’t want to take the risk of freezing another dog; some have stopped flying animals that way altogether. Today there are three ways to fly with your dog: you pay a lot of money for the dog to go in cargo (same pressurized air as the cabin, but this is where horrible deaths happen or dogs get out), you pay a lot of money for a dog that fits under the seat (generally 20 pounds) or you get a letter from a doctor or other professional saying you need emotional support animals. You have to have some condition that the Diagnostic and Statistical Manual of Mental Disorders says would benefit from an emotional support animal. I qualify, but for years I looked askance at people going through airports with their animals. Surely they were taking advantage of the rules. There’s a danger that if we loosen the rules for helping people with disabilities, the people who really need help won’t get the assistance and respect they deserve. The New York Times has also worried that people who use wheelchairs at airports to get around the growing security lines are milking the disability system, too. Would people think my beagles were seeing eye dogs? Nope. That turned out not to be a real issue. The people I encountered absolutely understood the difference. Service dogs are trained with the equivalent of a dog PhD. before they meet the person whose lives they immeasurably improve. Service dogs rightly get to go anywhere. My dogs got their certification through my diagnosis, not their skill. Huck and Moxie can go on the plane and a few extremely limited travel accommodations, but that’s it. I didn’t go in for any of the unofficial Emotional Support Animal badges and registry that you can buy easily online. I did have them wear sturdy Ruff-Wear harnesses that I already had. The only people I was worried about in a practical sense were people with allergies. The most severe allergies are to cats, not dogs. Still, dogs on a plane wouldn’t be fun for someone with severe dog allergies. (Contrary to what I and most passengers believe, we do get fresh air in flight, but tend to share it with those in the few rows around us.) So I gave them a bath the day before–the same thing therapy dogs do before going to a hospital to reduce their dander. Obviously I don’t care about the airlines: we have all gotten used to the adversarial way this game is now played. The airlines try to lure us in with a low fare, then charge every fee they can imagine and get away with. We, the customers, try to dodge the fees like they were bullets. Since my dogs are too big to fly in the cabin for a fee anyway, I’m going to do anything legal I can to get them there. As a practical matter this is how it works: I already had the diagnosis. I took it to a doctor who specializes in these letters. She asked me a boatload of personal questions, then signed off. I called the airline ahead of time–they gave me some pushback about two dogs, but were fine. I showed up with the letter. I did pay extra for us seats with extra leg room. I made sure the dogs peed outside beforehand in the right area. And I flew Delta from the Marine Air Terminal, which is an adorable toy airport. Not every dog would be right for air travel, but Moxie and Huck are nearly perfect. They are jolly, calm and always have time to say hello to someone. They are used to being model beagle ambassadors because everyone loves to say hi to a beagle. Nearly, but not quite, perfect. Moxie “Epoxy” sticks with her family. Huckleberry will run if he catches a scent of food. This lead to the one incident in our travel. For some odd reason, the dogs have to go through the metal detector with neither collars nor person. Huck had no problem. Moxie, however, didn’t want to leave me. I eventually got her through by pretending to throw a treat (The real ones were, unhelpfully, in my purse on the conveyor belt.) But just as Moxie went through, Huck got bored and took off through the LaGuadia Marine Air Terminal. I ran after Huck in my socks and my daughter and Moxie ran after me. Huck didn’t get too far–just to the free magazine rack. The TSA was remarkably good-humored about the whole thing. On the plane, the dogs settled in at our feet, mostly under the seat in front of us. They slept–except for the usual airplane bumps. The Delta staff at the were as nice as could be. The dogs didn’t bother anyone, even when the flight attendants brought around those delicious speculoos cookies. We got off to a surly, delayed crowd at O’Hare, which immediately made way for the beagles and smiled at them. The only disruption they caused was that so many people wanted to say hi to them. O’Hare is now starting to accommodate the growing number of emotional support travelers: last fall they opened a pet relief area in Terminal 3 (sadly, not our terminal.) Getting your dog certified as an emotional support animal seems to be the way of the future. Eventually someone will come up with a way to let airlines just charge us for a regular seat for our dogs. But for now this is the uneasy truce between dog people and the airlines.